This is a condensed version of our online DIY Ham Tutorial in which the steps we took to fully prepare, cure and smoke two Hams are in greater detail. We hope the simplicity of this brine cured ham recipe will inspire you to try making your own this year. 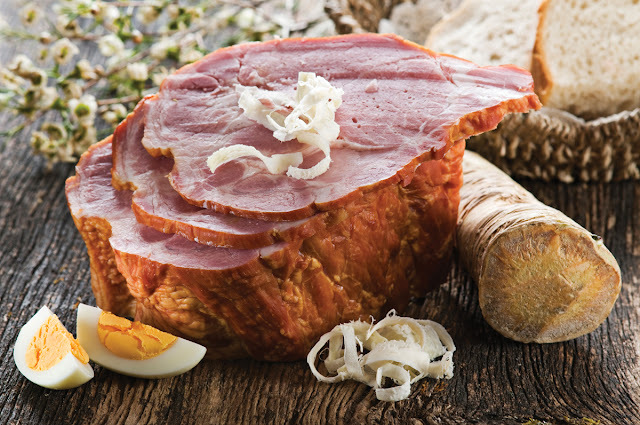 Go to your trusted meat market, hog farm or grocer’s deli and ask for “boneless fresh Ham” (you may need to pre-order and pick up when ready). We bought two, each weighing in at a little over 10 pounds. This ended up costing us only about $50 total, compare that to a smoked Ham behind the glass counter. Your Hams are likely to taste just like those and will cost you MUCH less. Once you have the ham at home, immediately refrigerate it until you are ready to pump the salty ham brine. You can also substitute the Dextrose with 1 cup of Honey or Maple Syrup, delicious. We had whole juniper berries, so we placed them on a tray and laid a plastic bag on them and hammered them into pieces, simple enough. Add water to your container, mix in your ingredients and stir with a long wooden or plastic spoon for a few minutes to disperse ingredients thoroughly. There shouldn’t be gritty salt grains at the bottom, if there are, keep stirring. 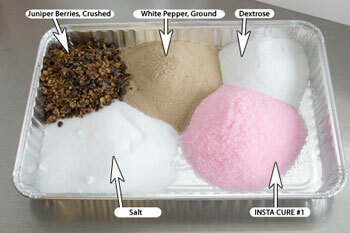 TIP: Heating up the water to 100°F to 140°F prior to mixing will help ingredients dissolve quicker and more solute. Cool before adding ham! *We do not recommend curing ham without stitch-pumping. The amount of the brine to be pumped into the Ham is 10% of its weight, so in our example, it turned out to be about 4 full capacity loads with our Meat Pump . It is important to pump the densest/thickest portions of the ham muscle. It is normal for some of the ham brine to spill out of the meat, it is inevitable, so don’t worry. TIP: At small home-scale production, One (1) Fluid Ounce by Volume is close enough to One (1) Ounce by Weight that we are equating them here. For precise measure 1fl.oz. = 1.043 oz. 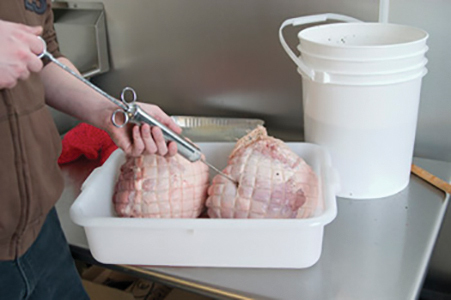 The temperature of Ham prior to pumping should be 38-40°F (refrigerated). If you are preparing a Ham that has the bone-in, make sure to pump around the bone. When the pumping is done, put the Ham in the brine bucket which should have enough brine left to entirely cover the muscle. It is alright to place one Ham on top of another as long as the top one is also completely immersed. If stacking, rotate top-to-bottom once a day. Place a plate with a water-filled jar on hams to keep them under the brine if you have to and place a lid on the container. The brining of the Ham should be done in a cooler where the temperature can stay relatively constant at 38-40°F the entire time. Aside from top-to-bottom rotating, it's really 5-6 days of leaving the Hams alone. Let the cure do its job and get into each crevice by itself. Remove the Ham from the brine solution and immediately rinse them under cold water while brushing with an unused bristle brush, and or thoroughly rinse for 3-5 minutes. Rinse, Do Not Soak. After you’re done brushing, place the Ham into a permeable, clean cloth bag or into a Stockinette Bag . TIP: Your bag should be moistened with a Water-Vinegar solution (50/50), or with a Liquid Smoke-Water solution (1 drop L.S. per 2 oz. water) this will prevent the bag from sticking to the ham. 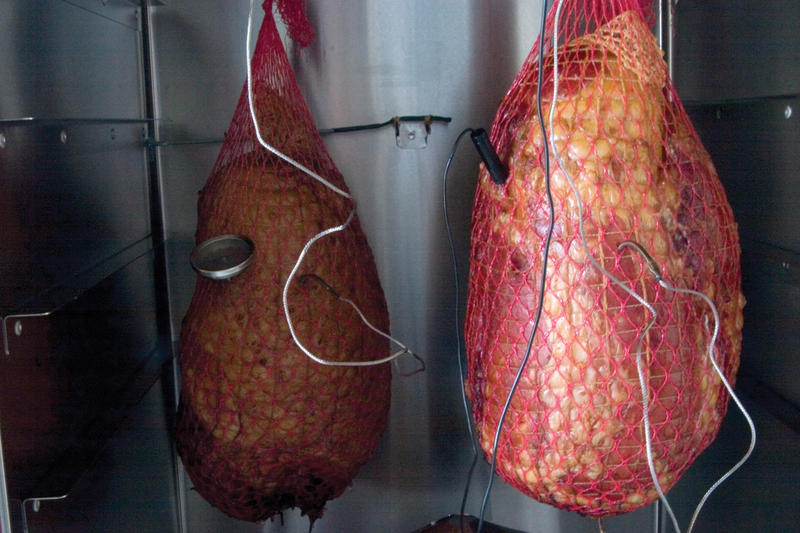 Tie the net/bag onto the Stockinette Hook securely, or if no bag available, place Ham on rack. Preheat your Smoker to 120°F. Just as in smoking Sausages, spacing is important, be sure the Hams are neither touching each other (if doing two), the interior walls of the smoker, and they should be at least 6” above the heating element diffuser. Insert the Remote Smoker Thermometer probes into both the Ham and one into the smoker. The dampers should be wide open for the entirety of the drying process. Check once every hour, for the first few hours. The drying may take 8-12 hours when the outside is tacky to the touch and it isn’t dripping from the bottom… drying is done. Open dampers/vents half-way. Set the temp. to 130°F and add a full pan of dampened Sawdust Woodchips . One smoke application lasts a little over 2 hours. On the second smoke application increase the temperature setting to 140°F for another 2 hours and close damper to 1/4 open. On the third smoke application (our last) increase the temperature to 150°F for a final 2 hours. You want between 5-7 hours of hot smoke for good flavor penetration & color development. Remove the sawdust pan, without smoke, bump the temperature up to 165°F for 2-3 hours and then set and leave at 175°F. TIP: Usually in the 140-150°F internal meat temp zone, when cooking at temps between 170-200°F, the meat’s temp will STOP CLIMBING. Called a Plateau, or Stall. The cured ham meat is releasing moisture to the surface, which is, in turn, cooling the outside, and consequently the inside. In short, ‘it’s sweating’. It can sweat for 30 minutes or 2 hours, depending on temperatures. Don’t panic, it is normal and it will pass. Still panicked? Wrap tightly with Aluminum foil containing a small amount of water or apple juice once it plateaus. When the temperature reaches 145°F internal, the Ham can be removed from the smoker. Cool to room temperature then refrigerate overnight before carving. 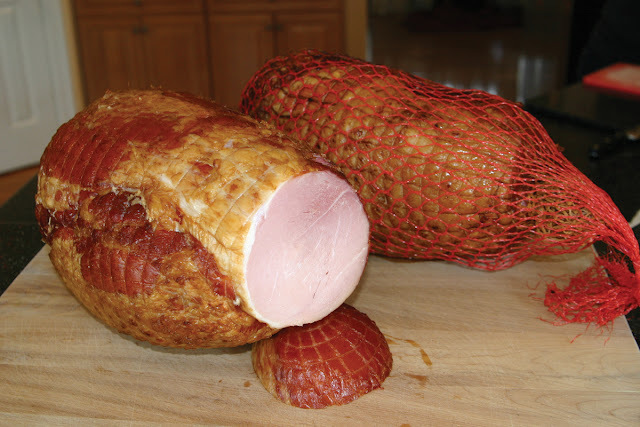 We hope you enjoyed this home smoked ham recipe, have found it easy to understand and will partake in some Do-It-Yourself ham smoking this year!